Lucky are those kids, whose parents sow the healthy seeds of Yoga at a young age! We make it happen for your dear ones every Saturday at Aundh in the form of 2 hours of fun-filled activities including Yoga – for an overall development of their body, mind and soul. Children of the age group 5-12 yrs can enjoy a two hour session. First Hour – Focus Yoga with fun. Dynamic Yoga practices as recommended for the age group. 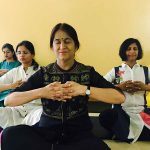 Proper breathing techniques and Neti Kriya to improve lung functions and strengthen the immune system. Mantra and Omkar chanting for voice culture and improving memory. Tratak and Eye exercises for better vision and focus in life. Second Hour – Focus on other activity to channel a young mind. Craft activities like pot painting, paper craft, jewellery making and many more to improve concentration, motor development, and creativity. Personality development with proper etiquettes. Once in 3 months trekking activity to a close by hill.